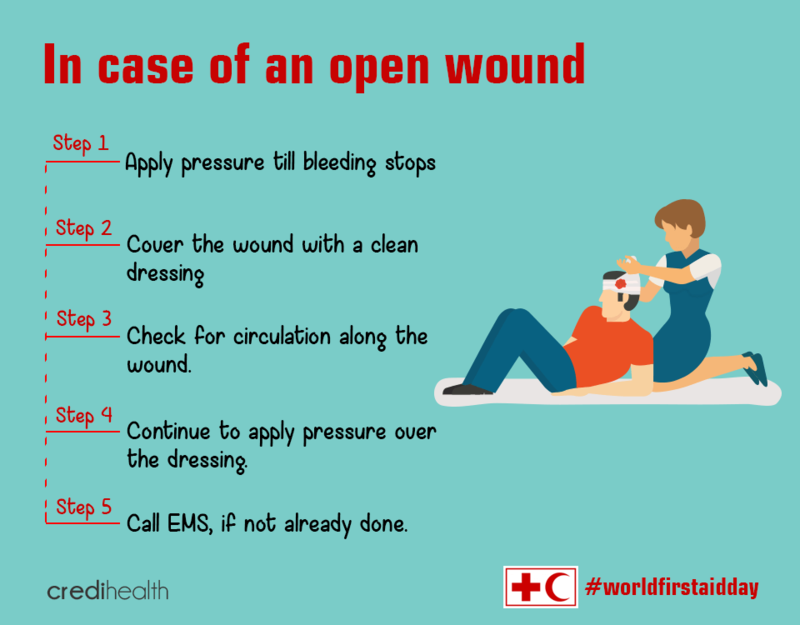 World First Aid Day was constituted by the International Federation of Red Cross and Red Crescent Societies (IFRC). It is celebrated on the second Saturday of every September since the year 2000. First Aid is defined as the help given to someone who has suffered from a sudden injury or illness. The goal associated with providing someone with First Aid is to save the life of the concerned person and prevent his or her condition from worsening. The need to perform First Aid on someone may arise in any day to day situation be it a road accident, some kind of disaster or a emergency health condition that requires immediate attention. Therefore, First Aid is not necessarily performed by a medical professional, instead it may have to be performed by an ordinary individual. First Aid doesn’t necessarily require an in depth medical knowledge but the person performing First Aid should be aware of the basics if he or she doesn’t want to do more harm than good.Therefore, IFRC encourages and organises basic training in First Aid to ordinary individuals around the world. World First Aid Day aims at promoting the concept of First Aid performed by an ordinary individual and spreading awareness about the same. It aims to spread the idea of saving lives in a situation of crisis, by the resources at hand. First Aid training goes a long way in saving millions of lives during natural disasters, organ failures and accidents. Each year a new theme is picked up by IFRC to promote the accessibility to First Aid . Each year events and functions are planned surrounding the theme. . This year’s theme is First Aid FOR & BY Children. It aims to teach children to provide first aid to those in need around them. It also aims to impart training to parents who are willing to learn how to perform First Aid on a child in need. This way the child training is different from the adults and can be incorporated to save lives of millions of teens that are dying on a regular basis due to drug overdose etc. The aim of First Aid training is to empower an ordinary person to minimize the effects of accidents, illnesses and disasters , till professional medical help arrives. This year’s Red Cross society aims to build first aid skills among 11-16 year olds. MAny online awareness camps and competitions have been organised for the same. This will help build the importance of First Aid among the youth of the countries around the world on an international platform. Step 1 : Bend the person forward and give back blows(between the shoulder blades by hand heel). Step 2: Hold the person from behind and give abdominal thrusts. 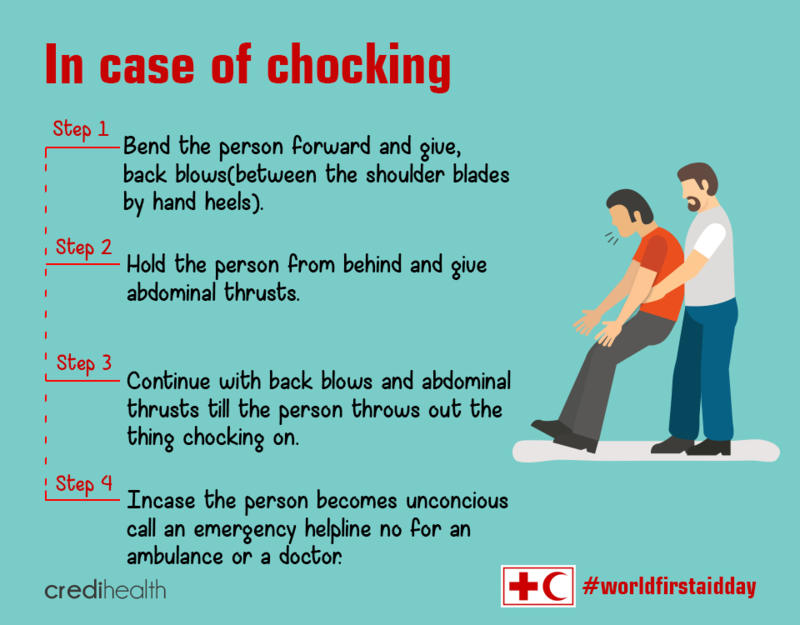 Step 3: Continue with back blows and abdominal thrusts till the person throws out the thing chocking on. Step 4: In case the person becomes unconscious call an emergency helpline no for an ambulance or a doctor. It is an important technique which can help save lives during an heart attack or drowning situation, in which someone’s breathing or the heartbeat has stopped. The American Heart Association recommends to start CPR with chest compressions. Step 1: Check for consciousness of the patient. Step 2: Check for the peripheral pulses ( wrist, ankle etc) and carotid pulses( medial to the neck muscle). 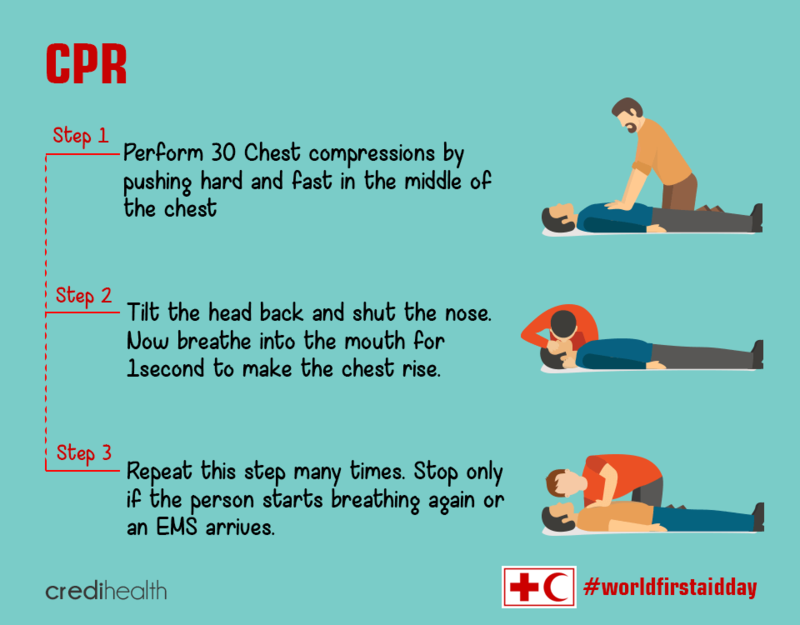 Step 3: (a)For untrained professionals perform hands only CPR (100 compressions per minute). (b) For trained professionals, begin with 30 Chest compressions by pushing hard and fast in the middle of the chest. Step 4: Tilt the head back and shut the nose. Now breathe into the mouth for 1 second to make the chest rise. Step 5: Repeat this step many times. Stop only if the person starts breathing again or an EMS arrives. Step 1: Apply pressure till bleeding stops . Step 3: Check for circulation along the wound. Step 4: Continue to apply pressure over the dressing. Step 5: Call EMS, if not already done. Step 1: Cool the burn with cold water for relieving the pain. Step 2: Loosely, cover the affected area with sterile dressing. 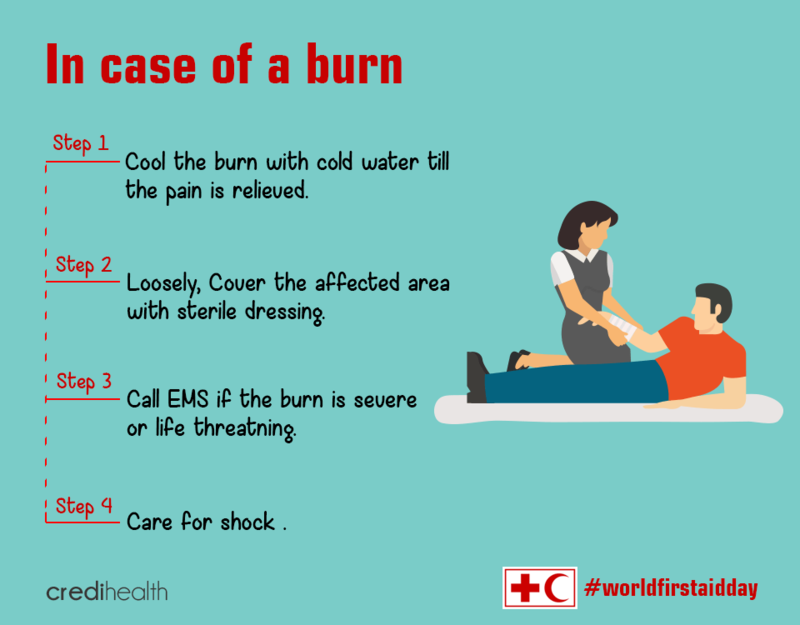 Step 3: Call EMS if the burn is severe or life threatening. Step 4: Care for shock . Step 2: Minimize movement of head, neck and spine. Step 3: If head is on one side, don’t move it. Step 1: Check for spinal, neck or head injuries. F: Face : on smiling check if the face droops on one side. A: Arm: On raising both arms check if one of the arm drifts downwards. S: Check for delayed or slurried. T: Well in time, call EMS. Step 3: Calm the person down. All the above mentioned steps can be used to provide for medical assist at the time of any contingency. Millions of people die around the world because of delay in medical assistance. Knowing and being able to perform First Aid while medical help arrives will help save millions of lives. First Aid cannot replace the technical medical assistance but it can sure help save a life which needs immediate action. First Aid reduces vulnerabilities and helps build stronger communities. This First Aid Day let’s all get together and learn to turn the mundane into a hero and a survivor !